The NV V9 is a three strut full wing tip kite that is so predictable you will feel like your kite has ESP. The NV is for the multi sport kiteboarder that wants performance while free riding, boosting, unhooking, foiling and riding waves. The NV feels super solid in the sky. Great stability with no give in the kite. In the appropriate wind range, you feel like you can do no wrong. 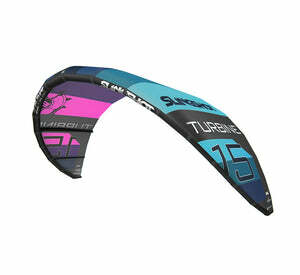 The VBG leading edge adjustment allows you have two different kites in one. The onshore setting has more bar pressure and grunt and the offshore setting has a lighter bar feel and more depower. No dead spots or loss of power in the turns. Works well for boosting, unhooked wake style, waves and even foiling. So easy that a beginner can use it. The Mission Control bar is one of the cleanest and safest bars on the market. The NV V9 has a certain amount of top end wind range and then it stops depowering. Pick the right sized kite and you are golden. The 15m size is great for wake style riders but lacks low end drive. If you are not unhooking, go for the bigger Solo or P1for 15m+. Redesigned with purpose. 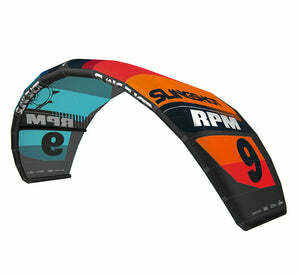 The NV Version 9 is just not a new color way or slight change that has no impact on the performance of the kite. We looked at the ways in which the NV has excelled over the past 8 years and then took into consideration what we wanted the kite to do beyond any expectations. No doubt the NV is synonymous with stability and dependability in all conditions and styles of riding. Not only does the new NV V9 embrace its heritage but it now will set a new standard in freestyle kites. The NV boasts a bold new complete airframe redesign. Squaring off the wingtips, combined with an entirely new leading edge to trailing edge profile has increased the handling and feel of the kite that will not only impress the freeriding specialist but will blow the mind of the wakestyle loyalist. Slight increase in leading edge diameter size, combined with integrated strut construction, has created a recipe for more responsive turn initiation and reactive feedback. This not only suits the needs of progressing riders but also the wants of aggressive unhooked trick masters providing smooth pull and controllable slack. Keeping true to the Liquid Force high quality build, the NV V9 utilizes a simple, supportive bridle configuration that retains shape of the kite in the craziest of conditions. Bomb proof construction points, such as the layered frame, and now the use of Teijin Triple Ripstop canopy material, will keep your confidence high to attempt that new trick over and over.